ARTIST CURATED PROJECTS: Raw Material – TRADES A.i.R. 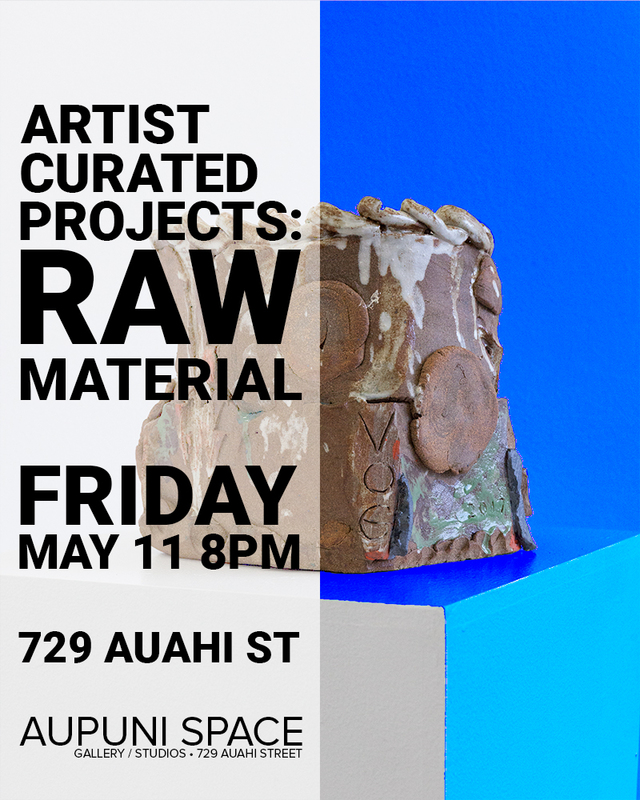 Aupuni Space is pleased to present “Raw Material” an Artist Curated Projects offsite exhibition, curated by TRADES A.i.R. artist in residence Eve Fowler. Eve chose five artists from O‘ahu to exhibit along with a piece made by Amy Yao while in residence with TRADES A.i.R. in 2017. In addition to her own art practice, Eve Fowler has organized exhibitions under the rubric Artist Curated Projects in various locations since 2011. In her studio visits on O‘ahu as part of TRADES, Fowler recognized the included artists were exploring their own methods of production, or process. The artworks shown suggest and recapitulate their own making. Kainoa Gruspe is a painter of everyday subjects, here a painting includes both a reference image of clouds as well as his own representation of one. Also exhibited is “100 Layers”, included in process at Layer 55; it’s progress is documented on instagram @100layerz. In collaboration with tropical plant scientists at the University of Hawai’i, Rebecca Maria Goldschmidt has been producing sukang ilocos vinegar in an exploration of her Filipinx heritage and collective cultural memory. She will activate her installation with vinegar tastings throughout the exhibition. Nikau Hindin’s video “Te Kiri O Tane”, made with Emily Lau and Rob Lau, illustrates the making of Kapa/Tapa cloth, learned from local cultural practitioners; she plans to return these methods back to her native New Zealand, reestablishing a lost traditional craft and re-contextualizing it as a contemporary art practice. Lawrence Seward presents a weathered wooden crate with one of his masks packed in soil, as if already en route; it’s lid is displayed on the wall along with one his paintings. Calvin Shimada constructs custom kilns of various sizes to fire his ceramics. Sculptural in their form, they are shown in the gallery along with his works fired within them. Amy Yao created ceramic works at UH Mānoa as the inaugural TRADES resident, a poetic souvenir of her time spent on O’ahu. Hours: Wednesday – Saturday 11 a.m. – 4 p.m. and by appointment.